We’ve been working with Pure London for many years now, both in our earlier days at the Ethical Fashion Forum and now as Common Objective, and it’s been encouraging to see interest and awareness around sustainability grow amongst exhibitors and visitors, as well as the dedicated team at Pure themselves. Like the fashion industry at-large, sustainability has been placed more and more firmly on the agenda every season. For the AW 18/19 show which starts this Sunday 10 February, Pure London have stepped up another notch and we’re very proud to be partnering with them on a programme of activity that celebrates the opportunity of sustainability for all fashion businesses. To attend any of the sessions below, or to come and meet the CO team any time during the 3 day event, simply register here for free. 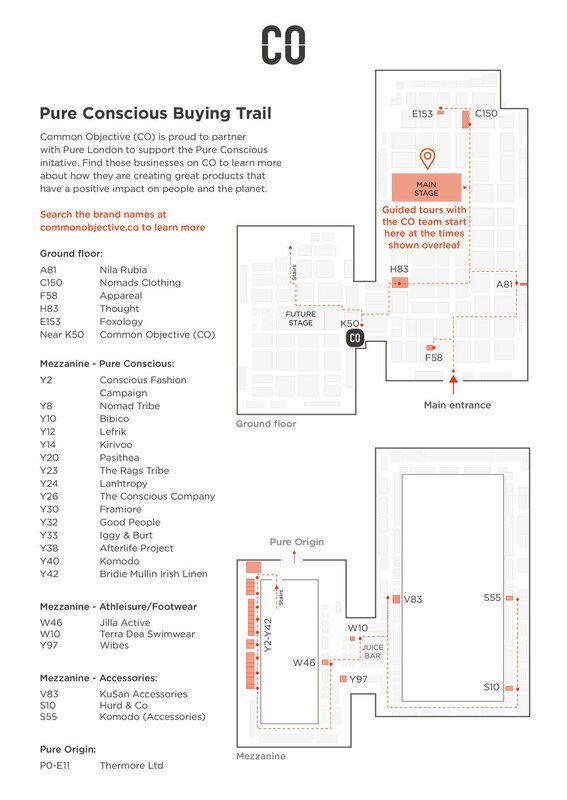 To make it easier for visitors looking for conscious brands, we’ve teamed up with 26 of this season’s exhibitors to offer a daily guided tour. These brands all have a profile on Common Objective (and you can too if you haven’t already signed up for free!) demonstrating their commitment to building a better fashion industry. The tours will be hosted by a member of the CO team - so you can ask questions about the brands themselves, about sustainability in general, or latest trends and innovation! They are conveniently timed to start directly after a key sustainability session on the main stage, every day. Find out more below - FYI this flyer will also be handed out in your goody bag upon arrival so that you have it to hand. Innovation, sustainable brands, and sustainable fashion thought leaders feature heavily across the agenda at Pure this season. We’ve picked out a few highlights below, but you can check out the full programme here. Hear about how the UN is working towards a better fashion industry and be part of Pure London’s Power of One 2019 campaign. Learn how to cultivate your business to build a sustainable brand. Join us on a curated tour of Pure. Meet conscious brands, ask questions, and see some of the latest in sustainable design. This isn’t one to miss! The dynamic Chair of the Environmental Audit Committee (EAC), Mary Creagh, speaks to Lucy Siegle about the recent EAC report looking at the impact of the some of the UK’s biggest retailers on the environment and what should be done about it. Join our very own Tamsin Lejeune as she presents some of the most exciting brands who are pushing the boundaries when it comes to design, creativity, and positive impact.